I’ve been married to Tyler for almost 7 years. We were living in Tuscaloosa when we started dating and got engaged. Right after our wedding, Tyler graduated from medical school and started General Surgery residency. 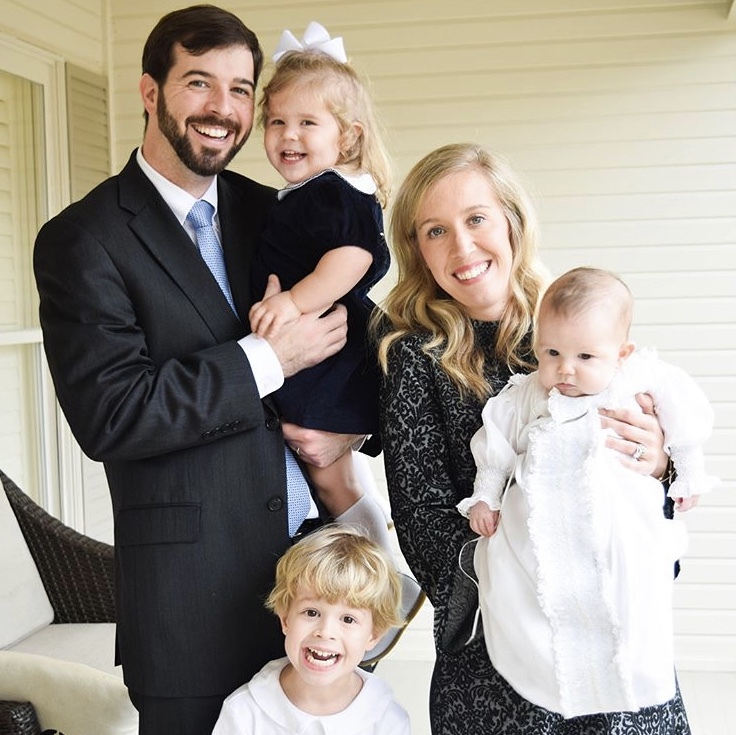 We lived in Birmingham for 5 years during his training and moved back to Tuscaloosa in May of 2017 where he joined his surgery practice. I am a part time Pharmacist but mostly stay busy with our kids, Ty (4), Evelyn (3) and Hamlin (15 months)! In light of Valentine's Day, would you tell us about how you and your husband met? There’s a saying that “life comes full circle” and for us I think it’s safe to say that is true. I graduated from pharmacy school at Auburn but completed my 4th year (intern year) here in Tuscaloosa. Tyler was doing UAB medical school rotations in Tuscaloosa as well. My best friend, Courtney, first introduced us in the library at University Medical Center. Tyler claims he “chased me around DCH” for a year and that I was oblivious to the fact. There may be some truth to that. He finally used my graduation from pharmacy school as an excuse to ask me on a real date. I obliged, and I knew immediately we were going to get married! Here we are all these years later, back in the same city, making rounds in the same hospital as a “real” doctor, loving our community and feeling fortunate to be raising our kids in this town (even though I am a ‘War Eagle’ girl). God is ever-faithful to me! But what stands out in my mind lately is the grace upon grace he bestows upon me every single day. When I fail as a Mom, Wife, Daughter or Friend, His mercies are new every morning! Rich! Only because being famous completely intimidates me! When the coffee is already brewed in the pot when I go downstairs first thing in the morning. If we ever forget to set it the night before... such disappointment! What age do you wish you could permanently be? Why? I wish I could freeze my current time in life! As hard as the days are with 3 small children, I know one day I’m going to miss this circus! My absolute favorite smell is a gardenia bloom. Running a marathon (which I’m planning to do this coming October)! I am loving early morning exercise, more frequent date nights with Tyler, and our community of friends in Tuscaloosa. Currently reading My Oxford Year by Julia Whelan. I read about 3 pages every night before I’m fast asleep.